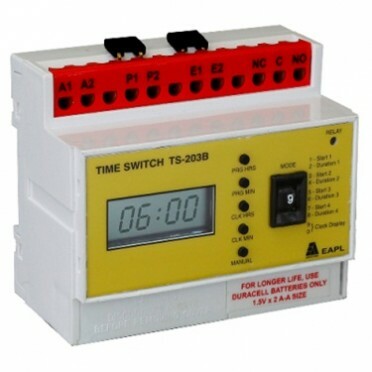 Real Time Clock in 24 hour format. LED indication for relay status, LCD display for real time clock, User Friendly programming. Clock hours and Clock minute buttons can be enabled by shorting terminals to program RTC. Features :Din sized enclosure for Track (Din rail) / Screw mounting.HOLD / RESTART facility during p.. Features :Suitable for screw mounting. 7 segment display indication for channel and timing operation.. Features :Real Time Clock in 24 hour format.Switches ON and OFF 4 times in a day with respect to rea..
For the speed control of electrically operated vehicles such as Forklifts, Golf Carts, Pallet Tr..
L&T GIC ON Delay Auto Reset Synchronous TImer Single Range BC42B1BC42B1B - EM1000 ON Delay Auto ..
L&T GIC ON Delay Auto Reset Synchronous TImer Single Range BM42B1BM42B1B - EM1000 ON Delay Auto ..